Flash version. Please Note: - an open circle means you should click on that part of the diagram to open that part of the map as shown in this video. These maps are done using the excellent Freeplane mind-mapping software. You are welcome to obtain the source and create your own version. Or submit corrections to me (there has been some mention of inaccuracies). There has been a request for dates to be listed. I have started adding that in the notes section of the gurus. There are many ancient masters of this path not listed. The primary focus of this lineage chart is to help those actively seeking a guru/system/path. 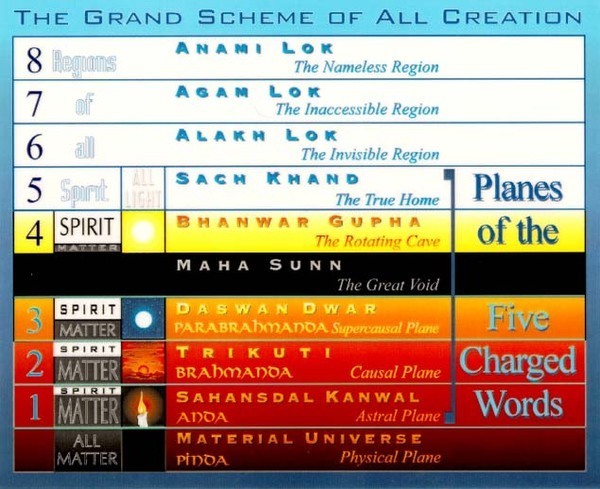 A number of the ancient masters were acknowledged by Pravesh K. Singh in a post of his. This version was done using FreeMind. This was the first version where the entire family of sant mat groups is on a single mind map. This version was done using Mind 42. In this version, the lineage data was broken down into several mindmaps, each containing a major lineage. He fought a number of social battles as well as writing a number of Shabad texts. Survived by some very good teachers. This lineage really has two sources. Paul Twitchell almost certainly was initiated by Kirpal Singh. However, Twitchell denies this and claims to have received the Rod of ECK from Rebazar Tarzs, an individual born in the year 1461, in the mountain village of Sarana in northern Tibet. He looks to be in his middle thirties but is thought to be over 500 years old in his physical body. I did this version using LaTeX but it has been swallowed up by the Law of Impermanence. I tried hard to keep it around but things rise and they fall and the wheels turn and turn and turn. Version 0 of this mindmap was done by a lady who ran the santmat-meditation.net website. Her website is no longer on the internet, but you can find her in the Wayback Machine. Click on Gurus Chart to see her version. The realms of Soul Travel. The vibratory streams of God depicted in planes based on increasing density as they emanate from Source. The most beautiful depiction I have ever seen - depicted by Aman Sandhu, webmaster of The Way of Mystics. 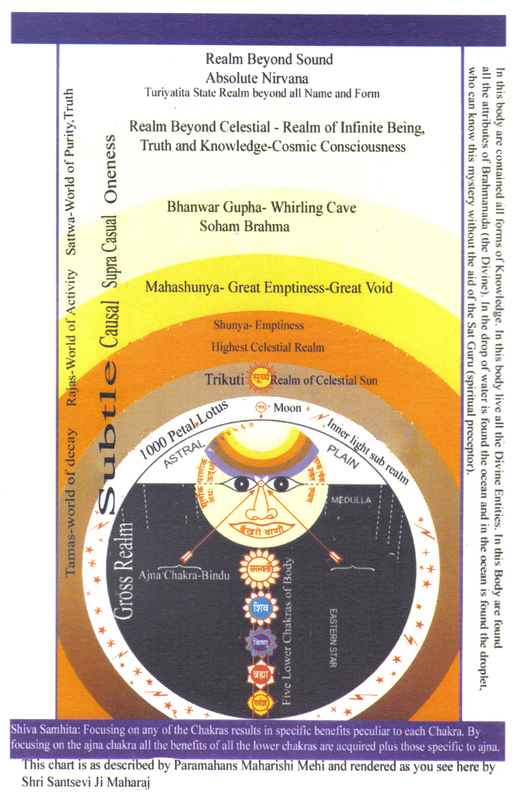 The Sant Mat Realms as depicted by Santsevi Ji Maharaj . Another depiction (quite striking) by Arran Stephens. A precise schematic of unknown original location. For a broader perspective on planes of existence, Kheper cannot be beat. I mean we have underworlds from the Shamans, dimensions with the Pleaidians... sheesh. Light and Sounds Links-A-Go-Go Various Sant Mat hangouts on the internet for your physical plane playing. If there were one site to recommend, it would be INNER SONIC KEY. W.C. Vetsch is a superman when it comes to melding Eastern and Western viewpoints on Sant Mat and related fields such as conspiracy theory, hard logic, high magick, math, gnosticism and fringe science. His Essentials of Mysticism is a master work. He's the only person whose grasp of the inner and outer is strong enough to remind me of Maximilian Sandor (aka Joachim Steingrubner). Spiritual Freedom Satsang is where I get my email on. Here you will find Michael Turner, the hippest hippie Sant Mat guru on Planet Earth. Who else is pro-marijuana and meat-eating in the Sant Mat community? Dont blood-test me (grin). Sant Santati is also an excellent group with very uptone participants. And of course Radhasoami Studies is great because it is unmoderated free-for-all action! Sound Current Rider is a site crafted with vision. This site was made from a mental blueprint. Not randomly thrown together. The only problem is, it's such a nice site, you want to quit looking at it and return to the inner (grin). When searching for Sant Mat and related items, be sure to use Duck Duck Go, a very nice search engine. Andrea Grace Diem graciously overviewed the Western systems. And again, Kheper has a wealth of associative information for those still interested in populating their Akashic memory banks with more relative knowledge on Reality (not Truth, mind you). Since joining Radhasoami Studies, I have gotten a lot of feedback on the lineage chart. I toss the most relevant interesting data on lineages in a mailing list. ... Here is my application to The Eureka Society. It includes lots of pictures of me.